Like light science fiction, fantasy and/or romance? Don’t mind a slow build-up to a fantastic finish? If so, the Coincidence Makers is for you. Emily, Eric and Guy meet in a 16-month training class for Coincidence Makers (CMs). CMs are secret agents that work for the government. They “are creators of possibilities, givers of hints, winkers of tempting winks, discoverers of options.” Some examples of their work is Lennon meeting Paul McCartney, the development of corn flakes, and the discovery of penicillin. There are other behind-the-scenes government workers too like imaginary friends, dream weavers, luck distributors, etc. I love the idea of mixing Men in Black with Harry Potter’s first year at Hogwarts. However, the execution was rather sluggish for the first half. I enjoyed the flashbacks to their schooling much more than their jobs immediately after graduation. I think it would have been better as a trilogy of books with the first only showing the training, the second standard CM work and the third book showing the highest level of CM work. With all of those topics put in this relatively short novel, it seems like an opportunity for a more in depth exploration of this world was missed. For the intriguing world, the Coincidence Makers receives 3 stars. However, the excellent ending ups the stars to 4. 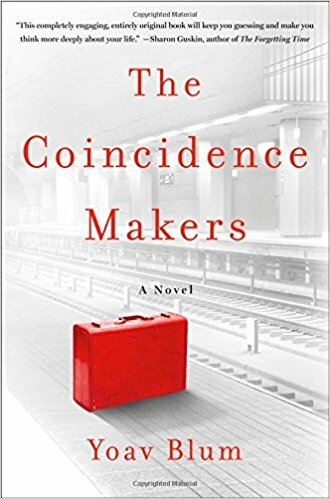 The Coincidence Makers is recommended for soft science fiction or fantasy readers that are willing to wait patiently for a big payoff. Don’t quit reading before the halfway mark as the finale is definitely worth a few more hours of your time. If you are not patient, just wait for the sure to be awesome movie (or movies) based on this book. Thanks to the publisher, St. Martins Press, and NetGalley for an advance copy.